If you’re vegan that you’ve probably received that look at least once. You know, the one of pure bafflement as someone looks at you and asks, ‘But where do you get your protein from?’ It’s a frustrating process trying to explain the many ways in which a vegan can get protein into their diet without the consumption of meat, but by then people have already made up their minds that you’ll be deficient in protein and become severely ill by living as a vegan. How wrong people can be! Being vegan means that you’re probably putting so much more goodness into your body. For years now, we’ve had the ‘meat is the only protein’ myth shoved down our throats but very slowly, people are starting to learn that while protein is certainly an essential nutrient which plays many key roles in the way our bodies function, we don’t actually need huge quantities of it. Only about one calorie out of every 10 we take in needs to come from protein. Vegan athletes, especially in the early stages of training, may have higher protein needs than vegans who exercise moderately or who are not active, but even in those cases, protein supplements aren’t needed to get a decent protein intake. Beans, edamame, nuts, peas, quinoa, tofu, tempeh, amaranth and lentils are all good sources of vegan protein. I’ve included a short video here to tell you more about how to get your vegan proteins. Here, I’ve found 21 great high protein vegan recipes for all three meals of the day, allowing any vegan to stay as fit as a fiddle whilst following a healthy, cruelty-free diet. 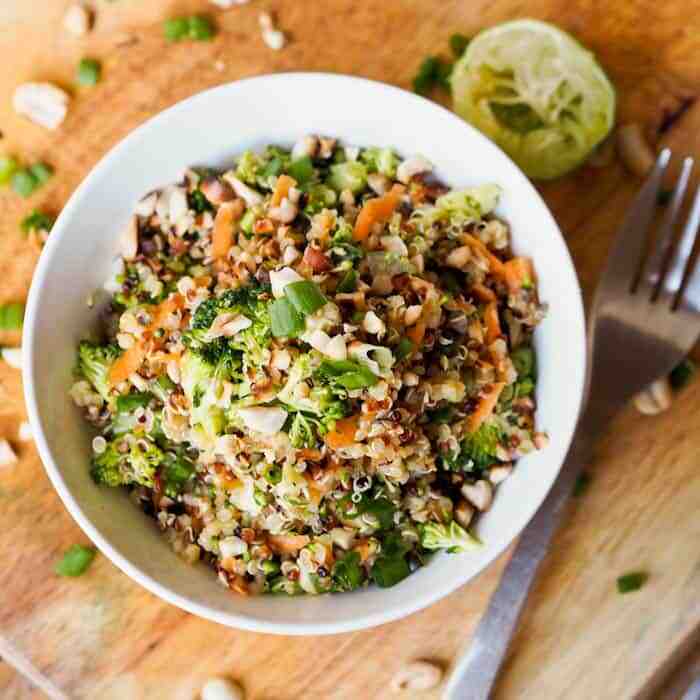 Quinoa is a great grain to add to your diet if you’re vegan, or even just looking to introduce some more healthy proteins. A typical cup of quinoa holds a decent 9g of protein–about the same as 1 cup of milk. This is a perfect lunch or even dinner to throw together and enjoy. It’ll leave your hunger satisfied, fill you up and it’s full of lots of other nutritional goodness, too. Even though winter is well and truly here, salads are still a great lunch to enjoy, and so easy to pack them with protein. 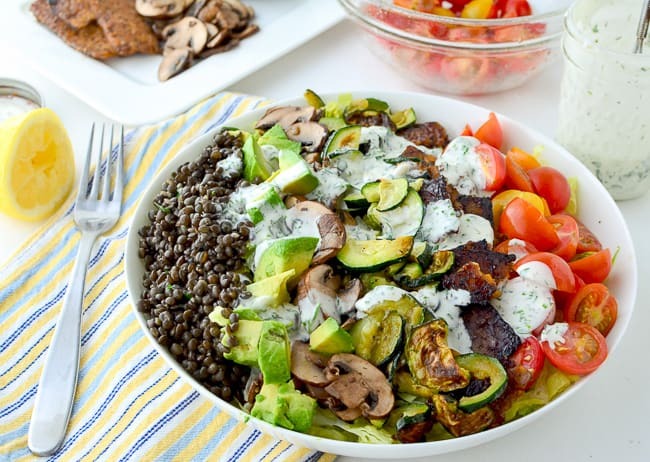 This salad alone contains 30g of protein from the tempeh and lentils. Salads take minutes to throw together and are a great way of using up lots of vegetables in your fridge. The key thing to remember when making salads is to keep them exciting. No one enjoys bland lettuce and shredded carrot! Salads can be an easy lunch but they can also be filling, so make sure you’re adventurous, add lots of protein and whichever vegetables take your fancy. We know you’ll probably take one look at this recipe and think, sweet lentils? Seriously? But trust us, this is a winning recipe. 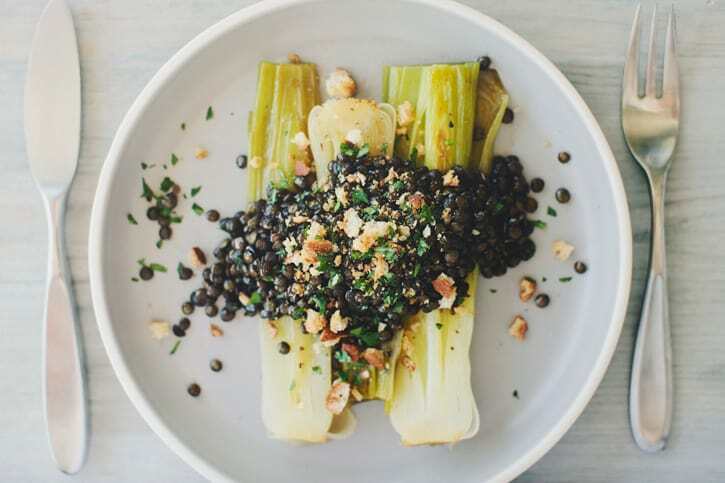 Braising leeks perfectly will give them a silky texture making them blend perfectly with the sweetened lentils. You won’t even feel like you’re having a protein rich dinner. If you’re not vegan you can always top this with an egg, but if you want this to be a full vegan protein meal, you should add some whole wheat pasta or brown rice as a side dish. Seriously, how good does this look? It’s exactly how food should be; packed with lots of veggies and bursting with colour! 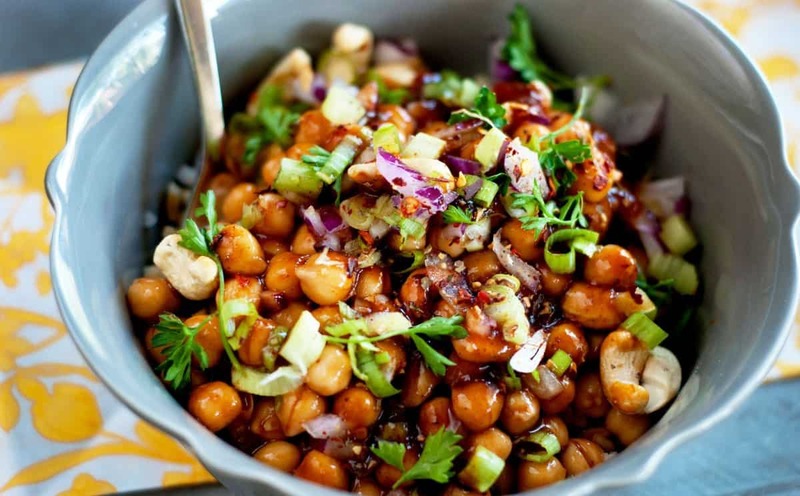 The addition of chickpeas to the base and topping gives this a massive protein boost, however you could boost this even further by sprinkling some flax or sesame seeds on the top. Also, if you follow a gluten-free diet then there are also instructions on how to make the dough gluten free. 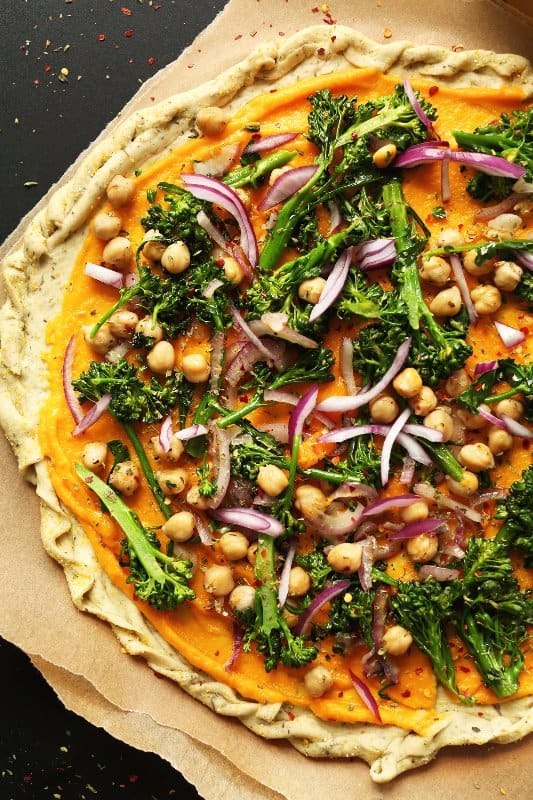 The typical tomato based pizza sauce is replaced by butternut squash here (SO amazing) and is covered with red onion and broccoli. Have you ever seen a burger look this bright and colourful? The answer is probably no. But rest assured, this is entirely vegan and that gorgeous colour is from shredded beetroot. The protein in this burger comes from the black beans and brown rice which, when combined, provide a full protein. There’s an explosion of flavours in this burger, all good for you. 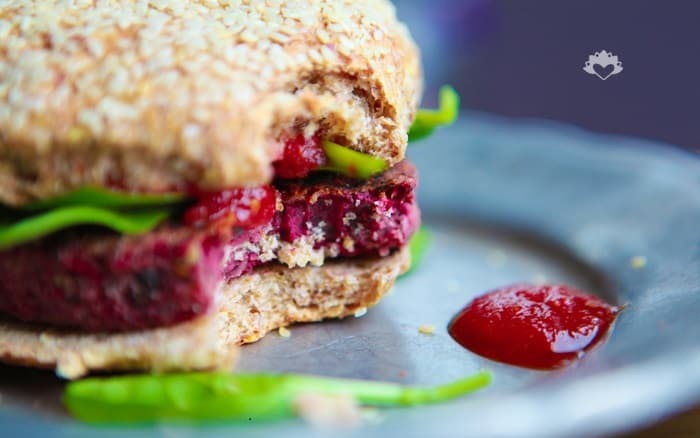 Add it to a gluten free burger bun and enjoy with a dollop of organic, sugar-free ketchup or some avocado slices. Lettuce wraps are a great way of enjoying foods. If you’re used to buying tortilla wraps or using bread why not switch it up and give this a try? You can serve them with your choice of sauce but we definitely recommend a sweet chilli sauce or if you’re feeling like something spicy try a sriracha. 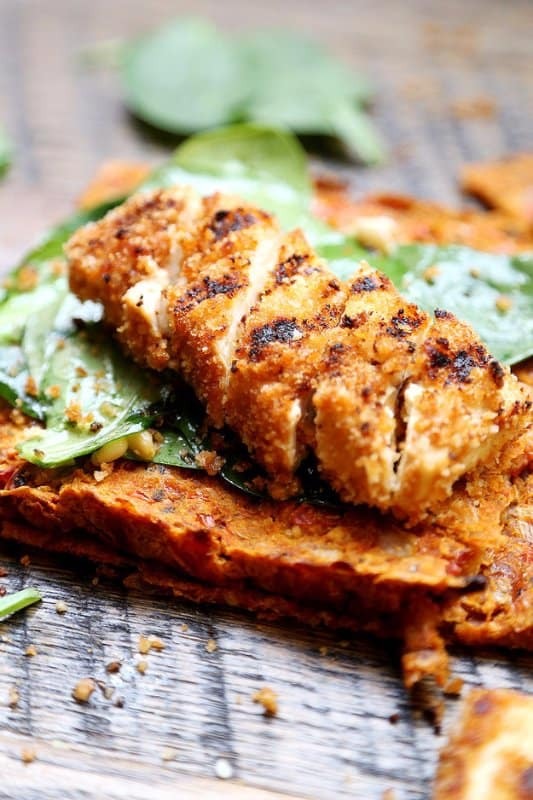 The protein comes from the tempeh which serves as the meat substitute. Then you’ve got the fresh flavours of cucumber, lime and mango. Yes, mango! Seriously, go try this. Like, now. 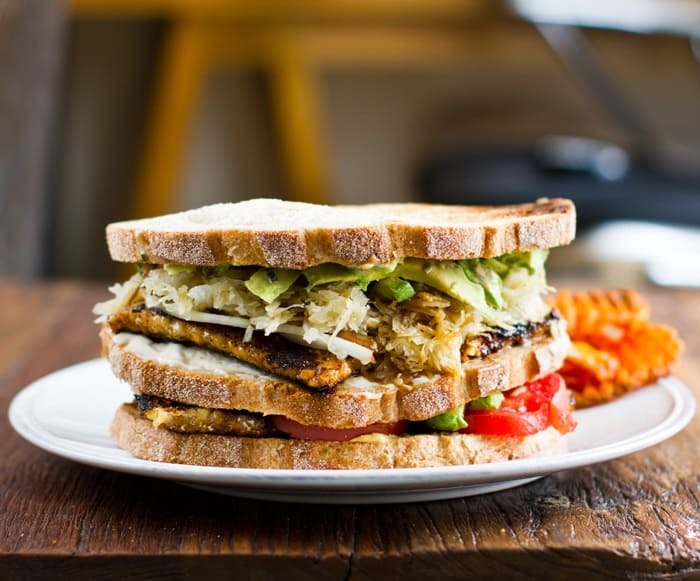 By now you’re probably thinking more tempeh? But trust us, not only is it a great protein it’s also a great substitute for cutting out meat. You can dress it up with different flavours or, like in this recipe, make it crisp up into a crouton. It’ll give the dish some depth as well as a little texture. The addition of soba noodles is a real winner as well. They’re mostly made from buckwheat which is naturally gluten free. When it’s cold and blustery outside there’s nothing nicer than a warm meal inside. And that’s exactly what this lentil soup is. It’s thick and it has a real quick to it which you can alter depending on your spice preference. 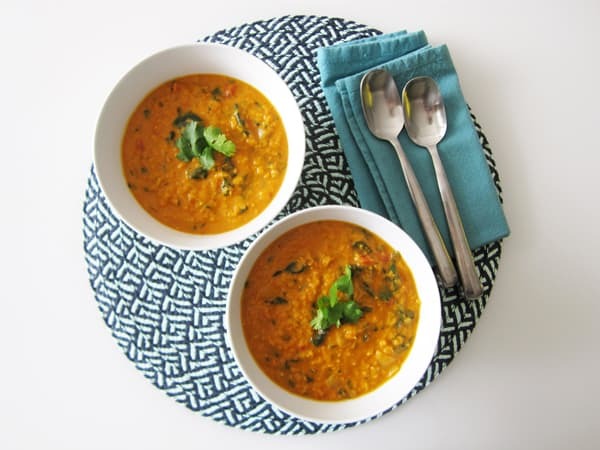 Lentils are a super convenient way of adding protein to a simple dish like soup. It makes it heartier, gives it more texture and is going to leave you a lot more filled up than you would otherwise. Plus they’re so quick and easy to use. Just remember: lentils are only a whole protein when a whole grain is eaten with them, so be sure to have a side dish of brown rice handy! Quinoa is a great protein packed grain to use when building meals. 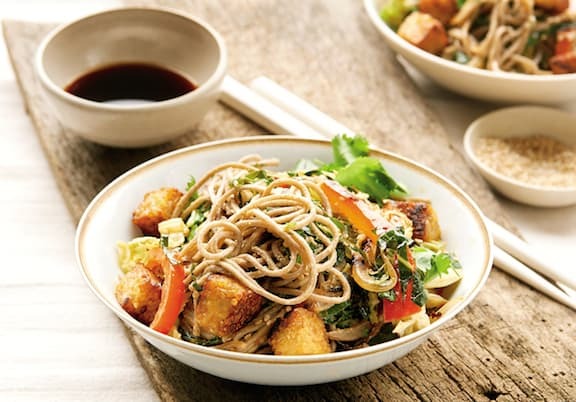 You can build around quinoa and pretty much add whatever it is you fancy, from stir fried vegetables to this tangy Asian inspired dish. The best part about it is if you have any leftover you can throw them into lettuce cups the following day for a second dish. I think the main fear before going vegan is leaving behind foods you’ll love. But being vegan is all about re-building those favourite dishes, just healthier and without animal products. I think it’s a fair assumption to say that the majority of people enjoy a cooked breakfast. 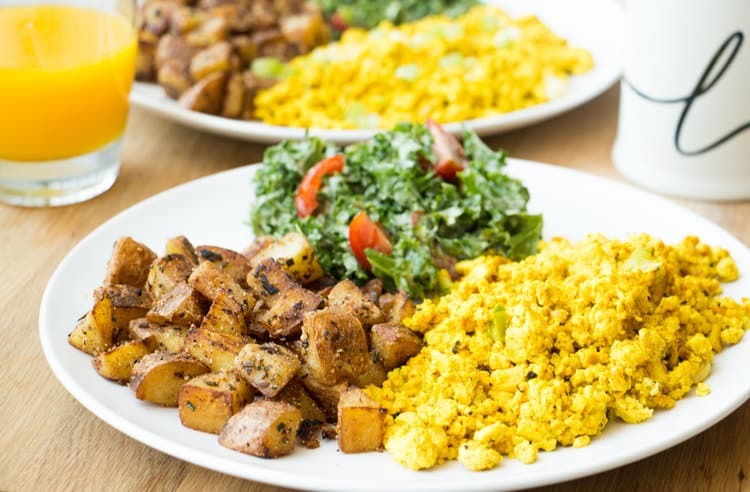 So this vegan-friendly breakfast is perfect for those who miss their Sunday morning fry ups! Plus if you want to make it a little more indulgent why not add some vegan sausages and grilled tomatoes? First and foremost, we must confess we are somewhat Mexican food fiends. Who doesn’t love Mexican food? Whether it’s a taco, a quesadillas or a burrito, it’s pure heaven. 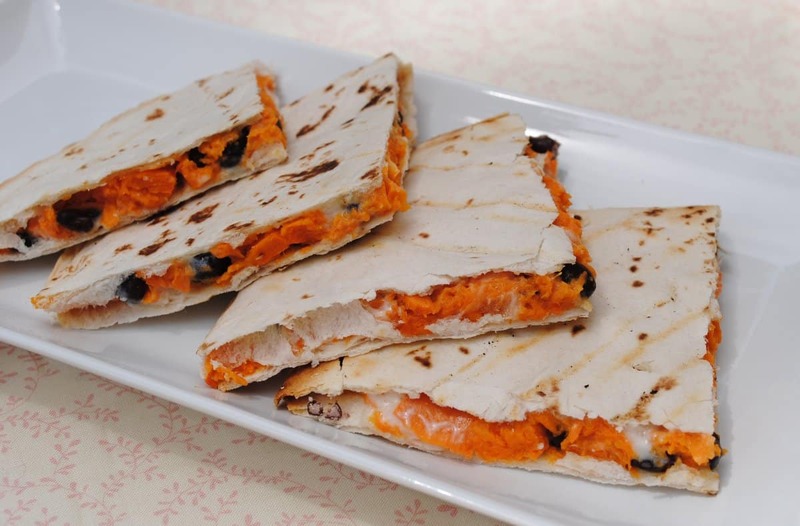 So this sweet potato and black bean based quesadilla recipe is perfect for bringing a little vegan-friendly Mexican food back into your life. 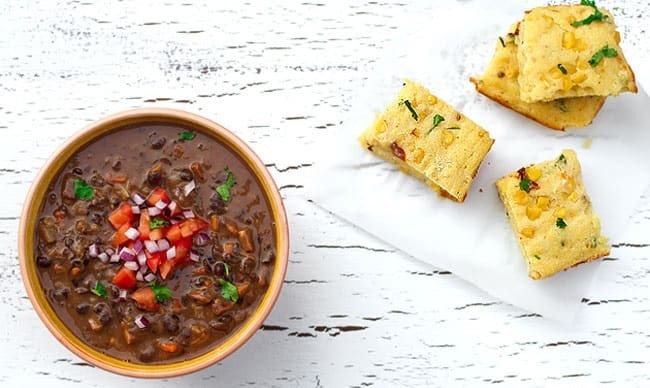 Usually a dish that is packed with meat, this vegan option uses smoked tofu giving you two boosts of protein from the additional black beans. There’s also a recipe for chipotle corn bread which will be delicious for dipping into this stew for a warm and delicious dinner. Stuffed peppers are a fab way to get a filling lunch or dinner. You can fill them with whichever grains and protein you desire. And the best part is that you can make them the night before for a delicious and nutritious lunch. 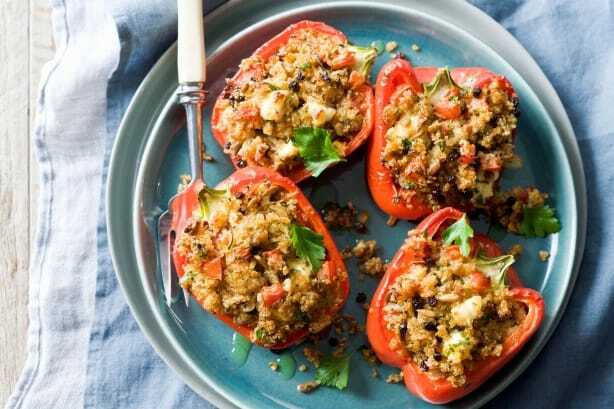 The protein in these stuffed peppers comes from both the amaranth and quinoa. They’re also packed with tomatoes, zucchini and sunflower seeds. You can sub the ricotta cheese for a vegan friendly version omit it altogether – it’s entirely up to you, but the fun part is being able to swap flavours for those you prefer. Patties are a great thing to whip up to see you through a busy week. They keep in a lock tight container in the fridge so that you can throw them with a salad or have them on hand when hunger cravings strike. 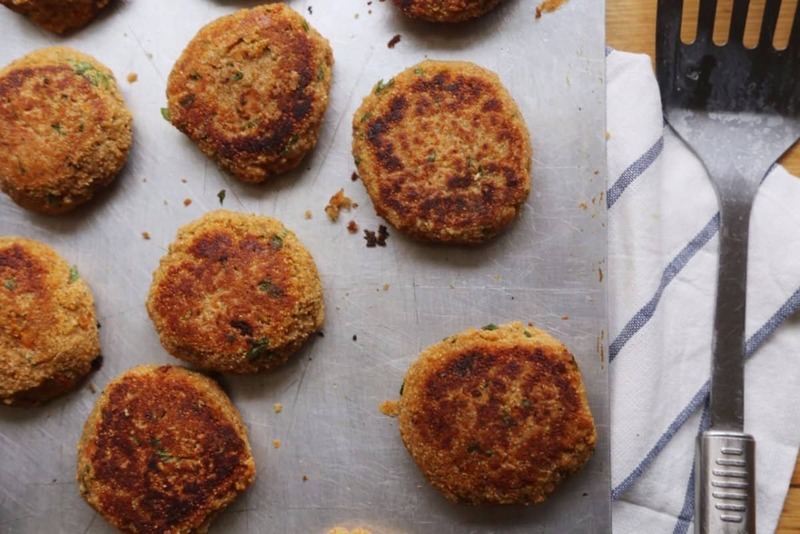 And these amaranth and red lentil patties are packed with protein! There’s also sweet potato, paprika and breadcrumbs . . . who wouldn’t fancy one? This is a vegan take on the ‘spaghetti and meat balls’ recipe. 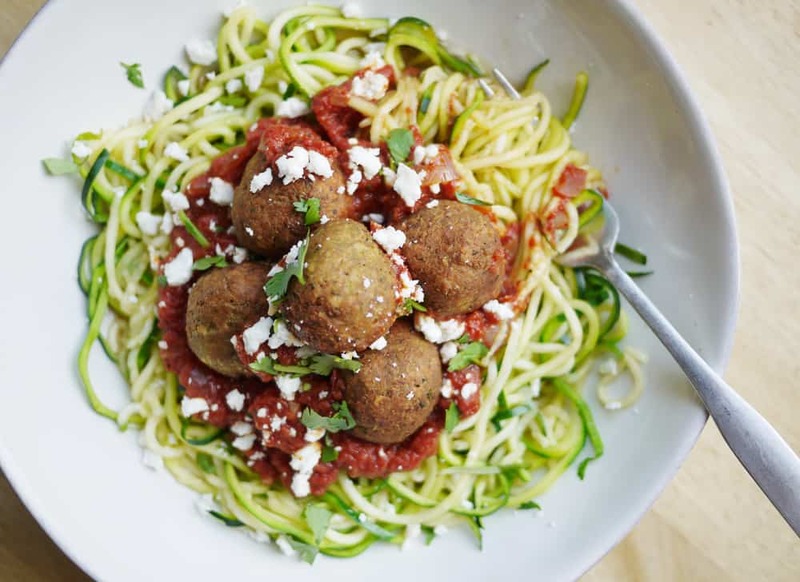 The noodles here are made from zucchini, the ‘meatballs’ are falafels made from chickpeas, an excellent protein source for vegans. Made with a tomato based source this should fulfil your Italian food cravings perfectly. Another fabulously flavoursome Asian inspired dish; Kung pao chickpeas. This sweet yet slightly spicy dish is the perfect accompaniment to some steamed rice. Crush some peanuts or cashews over the top and you’ve got a quick meal that’s full of protein and tastes insanely good. Hunger? What hunger? This totally filling ‘steak’ will fill up even those with the heartiest appetites. And guess what? It’s got a whopping 25g of protein per serving! 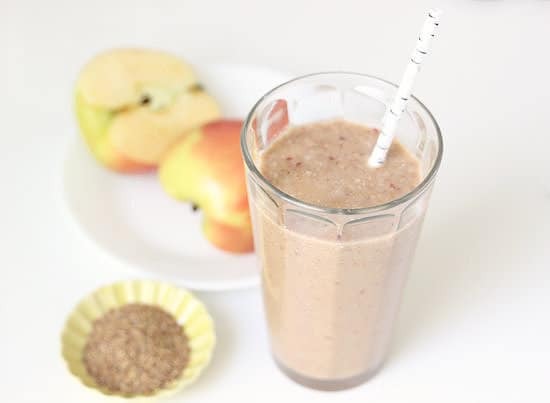 Another great recipe from Vega using their vegan protein powder. 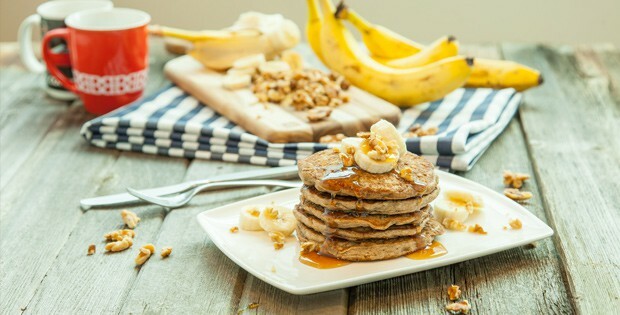 Seriously, who doesn’t love banana pancakes? And digging into a stack of them is always heavenly. More so when they’re covered with chopped nuts and a lashing of maple syrup, divine! Protein powders are a great way of getting protein, but not everyone likes these in a shake. Just make sure your vegan protein powder is 100% non-GMO and made without artificial flavours, colours and sweeteners. 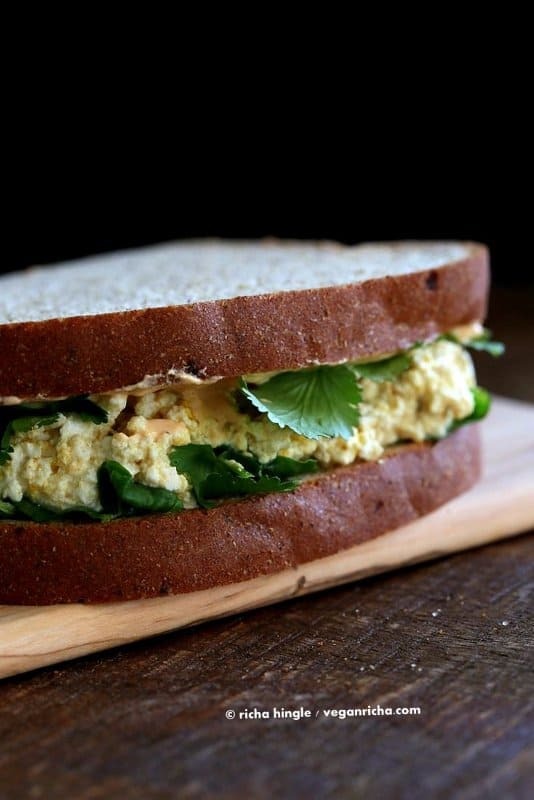 We’ve all been eating egg salad pretty much since childhood, right? While vegetarians can continue to do so, we vegans may miss the creamy, rich taste of an eggy sarnie. But no longer! This recipe will take you right back to those carefree childhood days, and of course, it’s the perfect thing to pack for a work lunch too. Having a protein rich breakfast is vital for getting your day off to a start. Most of us don’t have the luxury of time before setting off to work so making a smoothie overnight to enjoy the next day will guarantee you not only start your day off well, but you’ll be kept full on your commute, meaning you won’t be tempted to nip into a shop on the way and do a nagging hunger stop. The protein in this smoothie comes from the flaxseed and it is made with coconut water which will keep you hydrated at the same time. Bonus! Buying vegan friendly snacks can sometimes be expensive. When you’re popping into a supermarket and trying to find something you can often spent three or four pounds on a simple protein bar. So why not make your own? They’re cheaper in the long run, easy to make at home and the perfect snack to carry around to get you through an afternoon energy slump. They’re also perfect before or after a lengthy gym session. And these guys don’t even need baking! If you’ve not seen protein balls bouncing about in health food shops, then all you need to know is that they’re basically compact balls of all things good, and they pack a serious protein punch. Again, they’re perfect to have on hand when cravings start or to enjoy before or after the gym. Whip up a batch, store them in an airtight tub and they’ll last you for up to two weeks. 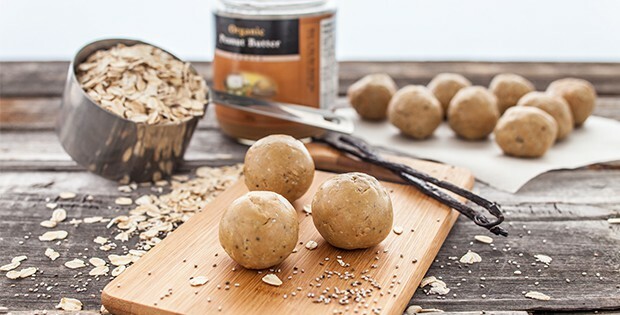 These protein balls have been made with Vega One protein powder, and peanut butter. 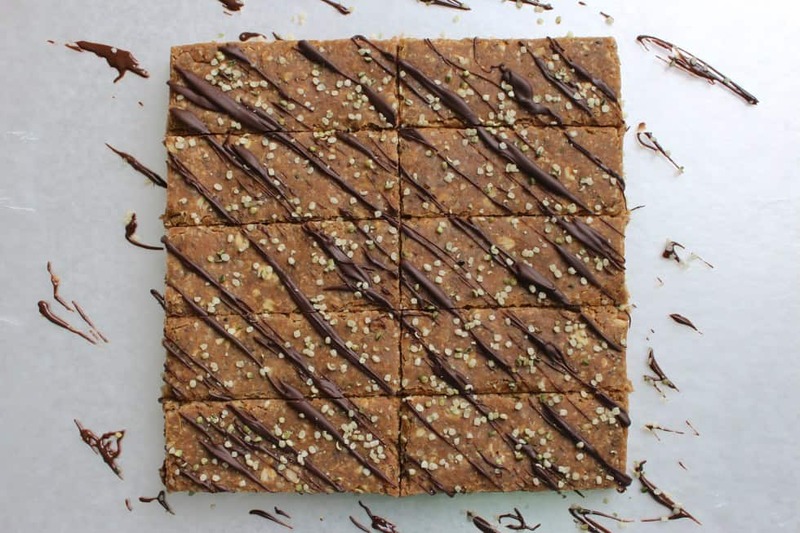 Vanilla and maple syrup make these even sweeter, and chia seeds add an extra dose of healthy fats.